The Philadelphia 76ers' Amir Johnson was caught on camera scrolling through his iPhone on the bench during Sunday's playoff game. The episode raises questions about sports, devices, and the workplace. When it comes to iPhones, the Philadelphia 76ers just can't catch a break. In 2018, the 76ers fired their general manager, Bryan Colangelo, following a bizarre scandal in which the team executive's wife, Barbara Bottini, was using several burner Twitter accounts to trash various players and reveal inside information about the team. During the investigation, conducted by an outside law firm, it was revealed that Bottini had attempted to obstruct the probe by factory-resetting her iPhone. On Sunday, the same team had an another unfortunate iPhone episode. During the fourth quarter of Philadelphia's loss to the Brooklyn Nets, ESPN's cameras caught Amir Johnson, a veteran player, scrolling through an iPhone on the bench, and showing whatever was on the screen to teammate Joel Embiid. Johnson was not an active player for the game, although Embiid was. NBA rules expressly forbid use of a cell phone on the bench. "This is really troublesome, to me," announcer Doris Burke said on the national broadcast. "That's a cell phone. And I can't definitively say but all of us know what a text message looks like. What is that thing doing out?" Not long afterward, Johnson was seen leaving the bench and heading to the locker room. The episode led to a huge amount of anger from fans of the team, already not in a great mood after the surprise loss. The 76ers almost immediately fined Johnson an undisclosed amount for conduct detrimental to the team, and the player, while explaining that his daughter was sick and he was checking on her, apologized. Embiid was not fined. In-game smartphone usage, especially while a player's team is losing, is the sort of talismanic thing that makes a bad loss even worse, especially form a fan and media standpoint. It's much like the recent revelation that members of another Philadelphia team, the Phillies, were playing "Fortnite" during games as their 2018 season was going down the tubes, until a veteran teammate destroyed their television with a bat. There doesn't seem to be much precedent for this, except for the then-New York Giants player, ironically named Eli Apple, who was fined in 2017 for tweeting from the sidelines during a game in which he was inactive. More often, the NFL and other leagues fine players for tweets and Instagram posts sent from the locker room at halftime. Chicago White Sox manager Ozzie Guillen was suspended by Major League Baseball for two games in 2011 for ripping umpires on Twitter after he was ejected from a game. "You check your phone at work, right?" The Johnson iPhone episode also raises some questions —why is using a cell phone on the bench taboo? And is it really that different from you or I texting while we're at work? Another veteran NBA player, Draymond Green of the Golden State Warriors, raised that very question on Sunday. Responding on Twitter to a fan who said he'd be "infuriated" if a team he rooted for looked at a phone during a game, said "Why? You check your phone at work right?" No, it's not exactly the same thing. In your job, there probably aren't television cameras watching you, or an angry crowd ready to pounce if you don't perform. But there is something to what Green is saying. In today's sports world, fans are expected to use social media and watch highlights on their phones during games, even while attending them in person. The in-game experience of most American sports leagues these days are full of hashtag prompts and other ways to encourage fans to use their phones to engage with the game they're watching. This is the case whether they're tweeting, voting in a scoreboard trivia contest, watching highlights, logging on to stadium Wi-Fi, or ordering tickets to a future game. Even the long-taboo subject of gambling is being embraced by the sports world. There are fans who pay large amounts of money to attend games who don't look up from their phone for the entire game. Is that much worse than one player sneaking a peak at his iPhone to check on his sick daughter, especially a player who wasn't even dressed to play in the game? If there was ever a time when sports leagues were trying to discourage phone usage during games, that ship sailed long ago. Look at the NFL. Players and coaches carry and use tablets during games, in order to call plays and watch video highlights. These tablets are Microsoft Surfaces, due to an endorsement deal with the league, although that has never stopped announcers from erroneously calling them iPads. But, if you think a player hasn't snuck a look at Instagram or text messages on their Surface during a timeout, you're probably wrong. NBA playbooks aren't as complicated as football's, but why shouldn't the NBA players get iPhone or iPads to, say, study the opponents' defensive sets during timeouts? This seems to be fine in baseball dugouts, and hasn't caused any problems in-game. And it isn't like the NBA doesn't have a commercial arrangement with Apple. Beats agreed to a deal in 2018 that will create team-branded Beats headphones for each team. There's even an Apple banner advertisement on the side of the Wells Fargo Center, the arena where Sunday's game was played. Amir Johnson and Joel Embiid probably should have known what the rules were in regards to smartphone usage on the bench. The next time there's such a situation, Johnson would be advised to either stay in the locker room himself or leave his phone there. 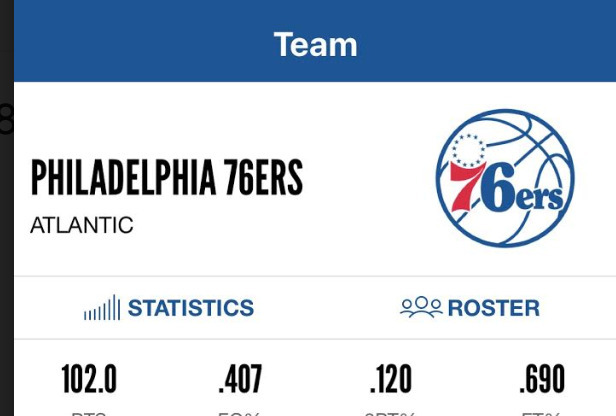 But fans of the 76ers would be wise to direct their anger at the team's poor three-point shooting, rather than the iPhone usage of someone who didn't even play in the game.